A money-laundering probe has put HSBC Holdings in the penalty box. U.S. Senate revelations about the British bank’s “perversely polluted” approach to handling suspect cash have tarnished its status as a crisis survivor. Beefing up compliance is a smart and necessary response. But HSBC cannot afford any more mistakes. The bank took some knocks in the economic downturn, largely because of heavy losses in a multi-billion dollar U.S. mortgage portfolio. But healthy capital, a prudent approach to risk-taking and exposure to fast-growing economies helped steady HSBC while competitors floundered. The Senate report overshadows all that. 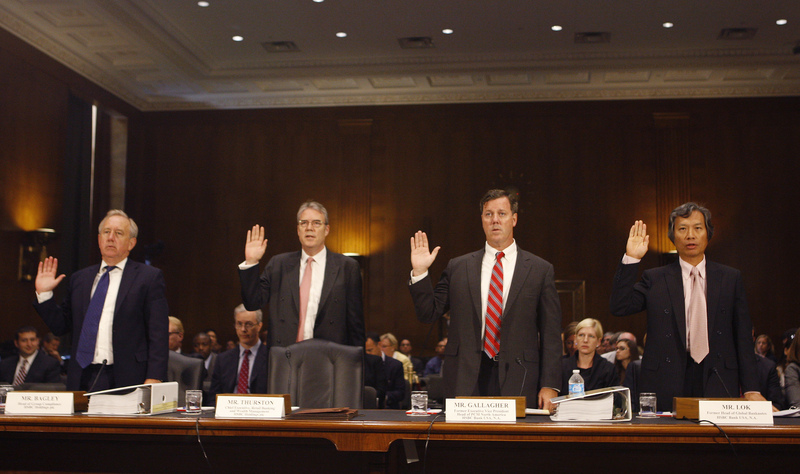 It says bank executives – and regulators – ignored illegal behavior for almost a decade. That’s bad enough. But the real shocks are in the dirty details. Between 2005 and 2008, HSBC allegedly moved more than $7 billion to the United States from Mexican drug cartels laundering profits. Between 2001 and 2007, bank executives occasionally advised Iranian institutions on skirting U.S. sanctions to make some 25,000 suspicious payments, according to the report. HSBC also allegedly helped transfer cash from North Korea and Cuba to America and dealt with a Saudi bank that the report says has links to financing terrorism. While highly embarrassing, the Senate report may be the least of the bank’s problems. A U.S. Justice Department probe could lead to criminal charges and fines of as much as $1 billion. The U.S. Office of the Comptroller of the Currency and other regulators are also investigating. The OCC has its own mistakes to answer for, of course. The Senate report harshly criticized the Washington watchdog for ignoring clear warnings of HSBC’s transgressions and failing to take advantage of opportunities to stop it. The Senate’s conclusions also leave the global banking system caked in even more muck. Barclays’ settlement of Libor-rigging charges, other banks’ possible roles in the scandal and JPMorgan’s multi-billion-dollar trading loss have rekindled investor fears about the industry’s bona fides. HSBC has promised to revamp its approach to ensuring it conducts business within the bounds of the law – and its chief compliance officer resigned before the Senate on Tuesday. A recent top-to-bottom revamp of the bank’s global structure may help, too. That, and keeping its nose out of trouble, is the least shareholders should expect. HSBC Holdings’ “pervasively polluted” culture allowed the bank to act as financier to clients seeking to route shadowy funds from the world’s most dangerous and secretive corners, including Mexico, Iran, the Cayman Islands, Saudi Arabia and Syria, according to a scathing U.S. Senate report issued on July 16. At hearings following the report, HSBC compliance executive David Bagley told a Senate panel on July 17 that he would resign. The findings came after a year-long investigation and nearly a decade of regulators’ warnings about the bank’s money-laundering problems. The report took HSBC to task for cutting costs at the division responsible for ensuring the bank complies with the law and detailed high turnover among the division’s officials amid a soaring number of suspect transactions. It also harshly criticized the U.S. Office of the Comptroller of the Currency for failing to curb the bank’s practices. HSBC acknowledged its mistakes and apologized to the Senate panel while outlining recent reforms aimed at strengthening compliance and risk management.